Experience all the excitement of American Idol as you journey from Auditions, to Hollywood and onward to the Finals round of competition! With real television clips from the first four seasons, plus show questions and performance challenges, American Idol - All Star Challenge will transform your living room into the ultimate TV talent showdown! Test your Idol knowledge as you relive all the trials and tribulations, the victories and the heartbreaks that have made American Idol one of the hottest shows on television today. This DVD game is based on the Emmy Award Winning blockbuster series 24. Players become CTU agents in this race against time. Each game begins with a terrorist act, and the agents are then briefed and given several clues to help uncover the terrorist's full plans. Participate in the onscreen games and challenges, analyze data and decide which clues to follow. Some clues will be vital while others may guide you to misleading evidence and dead ends. The DVD counts down the hours to the terrorist attacks and the first player to stop a threat to national security wins. The game includes a DVD, game board, game cards, label sheets, player tokens and instructions. For 2 to 4 players. Ages teen to adults. This DVD game is frighteningly fun and different every time you play! An update of the popular role-playing VCR game, the object is to be the first to collect the 6 different keys and make it to the Well of Fears. As you move around the game board, the Gatekeeper acts as your DVD host -- and he is one cranky demon! If you take too long during your turn, be prepared to withstand a firestorm of insults and wisecracks. It's a ghoulish game of strategy, smarts and sarcasm! Comes with DVD, game board, 6 movers, 37 plastic keys, 6 key holders, deck of Fate cards, deck of Time cards, Well of Fears, game dice, and instructions. For 3-6 players, Ages 16 and Up. Speed, not artistry, is the key to Pictionary games aimed at the younger set. Playing out like charades except by drawing on paper rather than flailing around, this party game has been popular for more than 20 years now. The Disney DVD version is geared toward kids and has been created with hundreds of characters, places, and things from the vaults of the renowned kid-friendly empire. In this classic game of quick draw, players try to correctly guess the identity of words and phrases that are being sketched before anyone else. It takes a quick hand and good guesswork to beat out opponents who are thinking along the same lines as you. To make the fun even more engaging, there is an included DVD with this version that provides a new twist. When a game card reads "DVD," have the disc ready in a player, grab the remote, and be prepared to shout out your answer first as a studio animator draws images for you to see on your television screen. Pay a tribute to the King of Rock n' Roll! Recapture and relive the life of Elvis Presley as you collect artifacts to create the greatest moments in Rock n' Roll history! 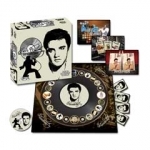 Featuring authentic video footage, images and photos of Elvis that will take you from the Gates of Graceland to Heartbreak Hotel and will leave you All Shook Up! In Mad Gab, it's not what you say, it's what you hear. Read a group of simple words aloud to "hear" the answer. For example, say the words "Ask rude arrive her." Do you "hear" the answer? Try saying them again. Did you hear yourself say "A screwdriver"? Mad Gab Mania takes Mad Gab to a new level with visual and audio clues as well as 4 different challenges. Programmable Game Buzzers let teams compete head to head for exciting, quick play! 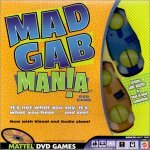 Just pop in the Mad Gab Mania DVD, grab your Game Buzzers, and get ready to gab! Tower over your friends as the ultimate movie mogul in this exciting game that has more movie trivia than any other DVD Game to date. Screen Test features hours of film clip fun with hundreds of questions spanning decades of films from the MGM library. Questions come from 6 different categories of movie trivia, each with 3 levels of difficulty. You may think you know your movies, but will you pass the Screen Test? Own a piece of paradise with Monopoly Tropical Tycoon DVD game! Your object is to build the biggest fortune by buying, trading, renting, selling, and developing island properties. With this exotic version of Monopoly, players now have jobs: Mayor, Developer, Police Chief, Artist or Surfer. Each job comes with responsibly and benefits. The DVD brings the adventure to life and allows you to make decisions that change the course of the game! Land on a Chance or Community Chest space and go to the DVD for news broadcasts to get a news story or perhaps part of a continuing one. During the game, the Banker will announce auctions with the property going to the highest secret bid. You'll also be able to improve your properties and increase your fortune with beach houses, resorts, parks, piers, and casinos. The game ends when one player goes bankrupt! Who's the fastest at guessing the secret password? The classic word association game is back in a DVD edition! Players guess passwords and score points. One team member slips on the special glasses to see the secret password, then gives a one-word clue to help his teammate guess what it is. New DVD edition combines all the fun and excitement of the game show along with the strategy and interactivity that has made the home version the number 2 best selling word game of all time. Featuring retro reveal glasses to enable only the clue givers the ability to see the Password. It's all in how you see it. Where does your mind go when you witness life's stranger than fiction moments? 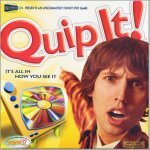 Find out when you play Quip It!, where players take turns trying to guess which player wrote which quip for bizarre pictures, unusual film clips and other on-screen oddities. The more right guesses you make, the more points you score and the more points you score, the better. Be spontaneous, be unpredictable, be edgy-it doesn't matter, so long as you Quip It! good. Includes 1 DVD, Round Score Board, 8 Scoring Tokens, Score Pad, Dry Erase Board and Pen, 8 Pencils, Answer Pad, and Set of Game instruction. For 2 or more players ages 13 and up. Name that tune! Who performed this song? What album's cover is this? Test your music trivia knowledge with this DVD-based game. Riff is the music trivia game that will rock your memories. We'll challenge your recall on groups, music videos, songs, lyrics, album covers, and more. From Grunge to Rap, Pop to Heavy Metal, Classic Rock to Alternative, Riff's got it all! Two teams compete through a series of puzzles, videos, and challenges to see who really is ready to face the music. Grab the remote, put the DVD in the player, and get the party started! For players in two teams, ages 12 and up. It's Trivial Pursuit for the 21st Century! Experts on the truly trivial will appreciate a game dedicated solely to popular culture. The objective of this game is the same as all other Trivial Pursuit games: to be the first to collect all the pie wedges. Only this time, the categories are Television, Movies, Music, Sports/Games, Fads and Buzz. Players answer questions from the cards just like traditional Trivial Pursuit games, but move to audio-visual questions from the DVD when going for the pie wedges. Comes with 2,400 card questions and a DVD with 600 DVD questions, pie wedges, pie wedge pieces, game board, and game instructions. For 2  6 adult players or teams. This edition of Trivial Pursuit combines all the fun of the classic boardgame with the Emmy award-winning late-night comedy show Saturday Night Live to bring you and your friends even more trivia fun! So grab your favorite character, and get ready to answer over 2,000 questions (450 on DVD) in six categories including sketches, famous impressions, commercial parodies, characters, SNL etc, and the show. To win a scoring wedge, go to the DVD to answer an on-screen question. Get ready to relive the sketches, famous impressions and unforgettable characters from SNL while challenging your friends to see who knows the most about this classic comedy showcase. Please Note: A TV and DVD player are required to play this game. Trivial Pursuit DVD For Kids is the hilarious game show you play at home! Join your hosts, Brad, Bobby, Mitch and Lewis for 12 hysterical episodes of head-to-head question-and-answer fun. Test your knowledge in 6 different categories. Answer the questions correctly and you collect a wedge. If you have the most wedges at the end of the game you win! Hurray! See Also: Party Games, Trivia Games, Scene It?